ARTIST STATEMENT: Whether it’s birds fornicating on a picnic table or a dancer losing themselves in the present moment, I want the viewer to hear the music of color because I believe color is the essence of painting. Working in traditional genres such as landscape, still life, and figurative painting where the format is already set, I have an opportunity to create expressive non-narrative canvases that, via composition, energy, and, especially, color, evoke emotional responses. My work often contrasts stillness with motion, solid objects with flat backgrounds, and painting in different shades of a chosen hue, resulting in qualities of dynamism and beauty. From a childlike disregard and a willingness to follow blindly the movement of my hand across the canvas, I allow form to materialize naturally without provoking it. Fine lines—scratches layered over contrasting chunky brushstrokes, daubs of light—unearth figures, become suggestions of life in the dappled world of the painting. Objects are partially obstructed because I want to leave it to the viewer’s imagination to create worlds or stories within the painting. Viewing my art is not a passive activity; it is a dynamic act of joy-making. Like a moving musical piece, my art is abstracted, ordered, and emotionally charged. 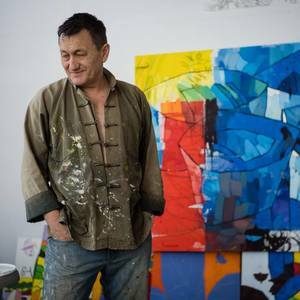 ***BIO: Vadim Puyandaev (visual artist/performer) has worked as a painter, sculptor, and designer for almost thirty years and has been participating in multimedia performances and installations since 1994. His fine art has been shown in solo and group exhibitions in Russia, Israel, Japan, Switzerland, France, Spain, Canada, and the US. He has also produced numerous pieces of monumental art. Puyandaev was commissioned to design a bridge over the Red Sea as well as a sculpture ensemble for the entrance to the city of Eilat in Israel. With Tsimbrovsky, he is a founding member of the creative groups of artists Avy K Productions (US), dedicated to investigating what emerges in performance at the nexus of different genres. He has been awarded by SOMArts, Stanford Arts Initiative, Zellerbach Family Foundation, Ministry of Culture and Ministry of Tourism in Israel, Salon des Leopards (Saint- Tropez, France) and is the recipient of the Grande Medaille Republique Francaise at the Festival Palmares des Blues en Peitute, France. Red Wind #2 is presented as an installation/exhibition at Eleanor D. Wilson Museum at Hollins University from 20 June 2017 to 2 July 2017. Solo Exhibition "Suggestions of life in the dappled. Minotaur ,"
Hermitage Art Center 1419 Stockton St. The Book: 'Page Two' at the Yerba Buena Center Arts 22 March. Sculptures in Action. Red Wind #2 an exhibition at Eleanor D. Wilson Museum at Hollins University from 20 June 2017 to 2 July 2017. AE Fall Open Studio Sept 25th-27th! Solo Exhibition "Suggestions of life in the dappled"
The Book July – Exhibition/Installation/Performances at SOMArts Main Gallery San Francisco, CA. Exhibition at Project Artaud Gallery, San Francisco, CA. Solo exhibition, Kurbatav Art Gallery, Vancouver BC, Canada. Exhibition in Farkash Gallery, Jaffa, Israel. Exhibition in the Nahamat, Eilat, Israel. “Erotismo” Exhibition. Gallery Art Zero, Barcelona, Spain. “9 Japan 9” is an international art-show in gallery Brocken, Tokyo, Japan. Personal Exhibition in the Philip Murray Center, Eilat, Israel. Group International art-show in Zurich, Switzerland. been executed in xylography under the topic “Dancing”.